Yesterday morning I detailed how I, Daniel Burch, was not afraid of the Cleveland Indians if the New York Yankees potentially faced off with them in the postseason but the team with 21 straight wins isn’t the only team I’m not afraid of. I’m not afraid of any damn Boston Red Sox either! Here are just a few of the reasons why. Well first and foremost you can look at the schedule and see that these two teams have split the 12 games they have faced off head-to-head this season. Six wins for the Yankees and six wins for the Red Sox but the most encouraging part of the those six wins for the Yankees is how well they have played against the Red Sox when Chris Sale was on the mound. Sale faced the Yankees in three consecutive Yankees/Red Sox series and Sale dominated one start, should have lost another if it weren’t for some late heroics by Boston on Sunday night baseball and the lefty took an “L” on the chin after getting knocked around in the third. With the Yankees showing an ability to have Sale’s number mixed in with the fact that the team has historically hit David Price, Rick Porcello and Drew Pomeranz better than most I feel supremely confident about their chances going forward. Add in a Doug Fister or an Eduardo Rodriguez into the Red Sox starting rotation and it may be Home Run Derby in October for the boys in pinstripes. The Yankees bullpen is deep and it is only going to get deeper once New York gets Adam Warren off the disabled list as he battles back spasms. As good as the Yankees starting rotation has been with Luis Severino, Masahiro Tanaka and Sonny Gray the bullpen may be that much better with David Robertson, Tommy Kahnle, Aroldis Chapman, Dellin Betances and Chad Green. These are not the Yankees that the Red Sox beat up on in July as Tanaka has been better, the bullpen has been better and solidified and Gray has been added to the mix. The Red Sox made moves of their own before the trade deadline but having Porcello struggle and having Price on the disabled list again with an elbow injury just isn’t what you want if you’re Boston right now. The final reason I’m not afraid of the Boston Red Sox is because, well simply put, they are the Boston Red Sox. The Curse of the Bambino has been reversed for 13 seasons now but there once was a point in time where the Yankees were the “daddies” of the Boston Red Sox and there’s no telling when that time could come again. With Greg Bird (hopefully) back in the mix and with the youthful and now healthy Yankees striding towards the postseason I say bring on the damn Red Sox. I want the best of the best on the way to World Series #28 because I want no excuses along the way. 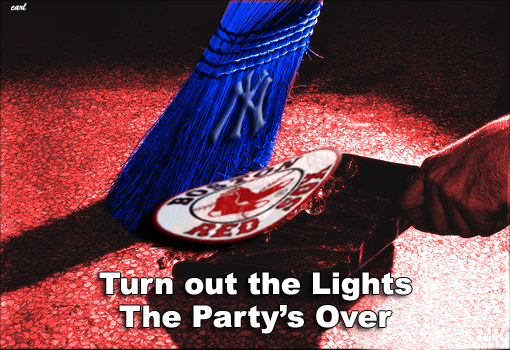 To hell with the Indians and to hell with the Red Sox too while you’re at it.